First, allow me to preface this review by saying that you can purchase this book in Australia, but there is no version available which features Australian spelling. Please don't let that prevent you from giving this delightful book a chance! 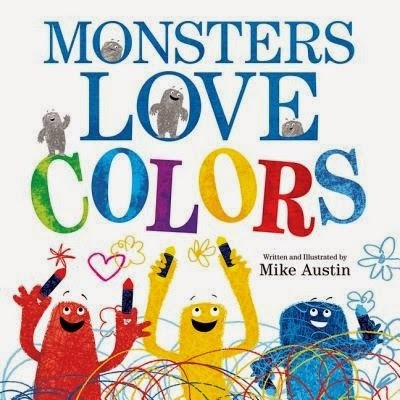 Monsters Love Colors, written and illustrated by Mike Austin, is a lively and enjoyable picture book that teaches children about colours. It's somewhat reminiscent of Drew Daywalt's The Day the Crayons Quit with a little Hervé Tullet thrown in. The book is a contemporary mix of metafiction, kookiness and scribbly illustrations as the monsters colour each other. What drew my attention to this book was the fun combo of scribbles and colours, and this is sustained throughout the book. The book also boasts some inviting repetition as well as a storyline easy enough, and monsters friendly enough, that your kids will want to hear this one over and over again (I speak from experience!). If you are a parent who finds yourself desperate for a book that teaches the kids about colours whilst not boring you to tears, have a look at this one.